Demonstrating compliance with ever-tightening global regulations that require financial institutions to keep a secure and accurate record of communications, including telephone, dealerboard and cell phone conversations, can be tough challenge. A vital part of the solution is knowing that you can reliably record, store and retrieve all your voice and data communications whenever they’re needed. With Red Box Quantify Recording Suite you get a highly advanced and easy-to-use recording solution that’s designed to help organizations in financial sectors comply with regulations. Quantify is designed to help your organization comply with the latest demands of regulators around the world. If you trade in the OTC derivatives or another heavily regulated market, the ability to keep and securely store trading records is key to regulations from bodies including the Commodity Futures Trading Commission (CFTC) and Securities and Exchange Commission (SEC). Failure to comply with regulations could mean heavy financial penalties for your organization. With Quantify, the time to ensure you have a working solution in place is now. Quantify Recording Suite with built-in Search and Replay helps organizations meet requirements for recording, storing and searching transactions for record-keeping. This includes regulations promulgated by bodies including the CFTC and SEC. Whether your organization uses fixed-line, cell phones or dealerboards across its front, middle and back offices, Quantify Recording Suite can be relied upon to capture all voice communications. To comply with legislation, Quantify uses a centralized time protocol which ensures that all recordings are timestamped using Coordinated Universal Time (UTC). For all organizations in the financial sector, data security is vital. Rules such as CFTC Rule 1.31 and SEC 17a-4 require that data is protected against alteration and deletion, with Write Once, Read Many (WORM) compliance central to this. 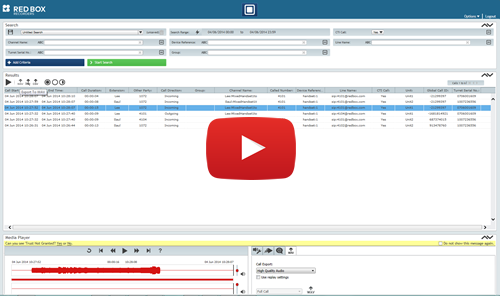 Quantify Recording Suite helps you achieve compliance. Its frame-based technology stores recordings in a proprietary format for secure preservation of data. All active recording channels across a system are saved into single frame files, each containing just a few seconds of data. This unique method means that there’s no fragmentation of stored data and minimal loss in the event of system failure. To further comply with regulations, Quantify is compatible with leading WORM-compliant Network Attached Storage (NAS) archiving devices. Red Box Quantify integrates easily with your existing system architecture and provides the resilience you need for business continuity. As the voice and data recording industry’s most agile deployment, Red Box Quantify offers advanced, highly usable and totally flexible functionality.